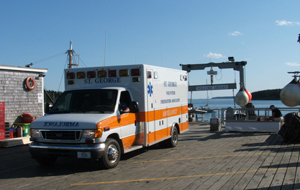 In the fishing community of St. George, Maine, EMS is the healthcare system. On a peninsula in southern Maine lies the small fishing village of St. George. Its population doubles in the summer, as more than 50% of its residents are seasonal. The closest hospital is over 20 miles away and so, according to Tom Judge, emergency medical services (EMS) is the healthcare system in St. George. Judge is a resident and former EMS member of the St. George Volunteer Firefighters and Ambulance Association. Started in 1952 and built up by some “good anchor families,” EMS in St. George has enjoyed strong volunteerism and community support. Judge described how the St. George EMS system grew and evolved from first responders to emergency medical technicians (EMTs) and then paramedics. For years, at its helm, he worked on a voluntary basis while he also held a full-time job. The ambulance service was completely volunteer and never charged anyone or sent out a bill. Built as an association, the group was evolving in the early 2000s, starting to partner with the nearest hospital and doing advanced care in the home through community paramedicine. But Judge, who is also Executive Director of LifeFlight of Maine and The LifeFlight Foundation, explained that the local association was at a crossroads. The association would train paramedics only to see them leave for other jobs and the town was increasingly having to rely on external services and mutual aid to cover their needed EMS services. 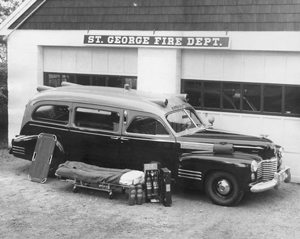 Ambulances such as this one from the St. George Volunteer Firefighters and Ambulance Association’s early days often resembled the hearses that predated them. In fact, the reality in rural America at the time more closely resembled a patchwork of varying expertise: first responders, EMTs, occasionally a paramedic, interspersed nonprofit or volunteer, fire-based or hospital-based organizations, all with the goal of providing the best pre-hospital emergency care possible. But that goal could be difficult to achieve in rural areas where the EMS system was, and still is, largely volunteer and sparsely staffed. A 2016 Minnesota Rural EMS assessment concluded that 59% of responding services did not have their shifts 100% covered for the next 24 hours. These gaps mean that rural EMS services have to find creative ways to staff their services. One rural hospital administrator commented some years ago that on his first day of work, the sirens went off and someone ran in and informed him it was part of his job to drive the ambulance. While there have been many advances in the delivery of emergency medical services, more modern equipment, and life-saving techniques, for almost 50 years the delivery of rural EMS has looked much the same. Community members often do not understand that the person who answers their 911 call may have to leave their job, dinner, or bed; may not have the skills and training to meet their emergency needs; or simply may not come at all because no one is available to answer the page. Kevin McGinnis, Program Manager at the National Association of State EMS Officials (NASEMSO), a renowned expert in rural EMS, agrees. According to McGinnis, the general public had no idea that when they called 911, the person coming through the door in rural America would look nothing like the TV version in their heads. 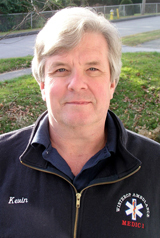 That disconnect became very apparent to McGinnis during his years working as a paramedic and service chief and his tenure as Maine’s state EMS director between 1986 and 1996. In fact, McGinnis highlighted a 1993 survey by a professor at Bowdoin College which found that 87% of people believed that a paramedic was going to respond, fully equipped for their heart attack. This did not match the reality of the type and level of response, especially rural, at the time. There weren’t any silver bullets in those approaches, and it’s nearly impossible to build a foundation on volunteers and bake sales. The difference between the public’s perception of the EMS system and what the system really looked like led McGinnis to start thinking about a process by which a community could be educated about what kind of EMS system they currently had, make an informed decision about what level of EMS response they wanted to have, and understand what it would cost to have the system they wanted. Thus, the Informed Self-Determination (ISD) process was born. It first appeared as a concept in The Rural and Frontier EMS Agenda for the Future, a 2004 book written by McGinnis and published by the National Rural Health Association. Judge commented that the community was experiencing some tough decisions in other areas and he wanted to draw people in to build consensus around EMS without contaminating the conversation with politics. Having worked with McGinnis during his time as state EMS director, Judge hired McGinnis to lead the community through ISD. The ISD process has four main components: an assessment, the examination of alternative models and cost impact, a decision-makers forum, and choosing and funding a model. While Judge shared that the entire process took about a year, most of the intensity and decision-making took place in just four months. EMS Informed Self-Determination consists of four steps that lead a community through a discovery and decision-making process. 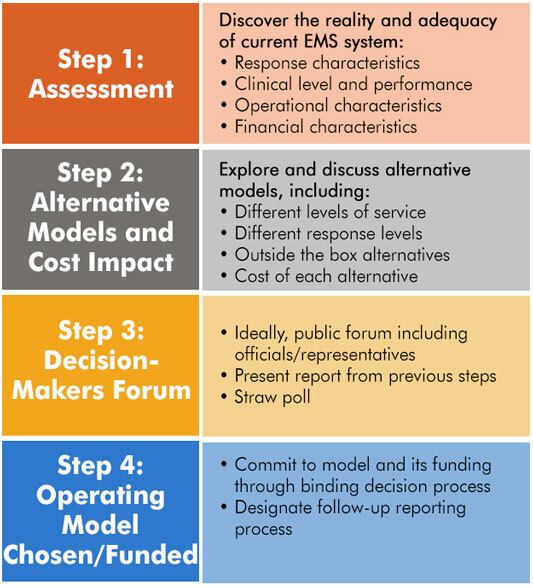 The ISD process takes a community through a series of questions with the ultimate goal of making a decision about what kind of EMS system the community wants and needs. A comprehensive community discussion is initiated with members from EMS, Fire, community government, healthcare leadership, concerned citizens, and other stakeholders. McGinnis explained that citizens first need to know what they have, and they need to know what it costs. The assessment might include what the current response looks like and if it is adequate, the clinical level and performance of the EMS system, and its operational characteristics. The assessment also includes a discussion of how the current EMS system is funded in the community and what the costs entail. 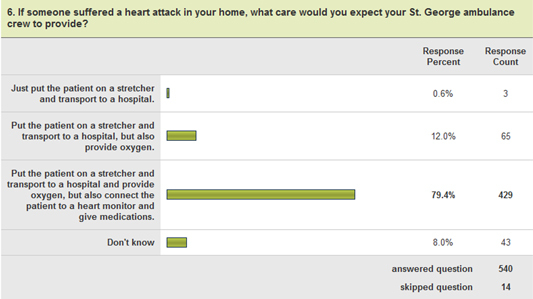 Survey questions in the ISD model attempt to determine the community’s view of the EMS system currently in place. Then community members need to examine what they want and, through the broadest discussion possible, get a clear picture of the alternatives and what costs associated with each option might be. Questions that might be asked include, “What is the alternative to basic life support (BLS) or a volunteer squad? What is the cost? What if we hired our own?” Costs of running a rural EMS service with a paid staff instead of, or in addition to, having volunteers could range from $200,000 to $750,000 or more, according to McGinnis. The process sets up the opportunity for discussion and debate. Judge described the process as “social knitting of the community, with EMS being one of the powerful threads.” Led by a survey which saw a 34% response rate from the year-round and summer population, McGinnis also conducted over 70 stakeholder interviews in St. George. The process included a deep dive into available data and multiple community forums. If a community doesn’t have a sufficient tax base, they may accept calling someone two hours away or putting someone in the back of a pickup truck to get to the nearest emergency room. That’s not a good EMS answer, but in most states EMS is not statutorily required to exist as an essential service like police, so it may be reality. Judge warned that EMS agencies undertaking this process must be aware that the result may not be perfect, but that the decision will be made by the community as to what is needed and what they are willing to subsidize. McGinnis noted that the ISD process can be jeopardized by personality and political differences that have created factions in a community over EMS issues. He adds that these soon become evident to ISD evaluators who factor them as objectively as possible. If the community chooses to pursue an EMS system that is different from what they have today, then the conversation turns to how to fund what they want. According to McGinnis, this sets up the opportunity for a binding decision process which may necessitate a change in mill rates or other taxes. Sometimes, the decision may be to become part of a healthcare system or incorporate in another way. During their ISD process, the St. George Volunteer Firefighters and Ambulance Association was retained as an independent nonprofit organization, but community support strengthened the fire and ambulance systems and the community decided they wanted to support full-time paramedics and community paramedicine. The ambulance was able to move their annual budget from its original $60,000-$80,000 to an approximately $300,000 budget without taxes because the community was willing to support it in other ways. Today the EMS system in St. George is more than emergency medicine and has expanded its role as a community health practitioner. They are even pushing some of their services out to adjoining communities and neighboring islands. An outcome that was somewhat unexpected is how the community has been able to build capacity in making decisions that are informed and community-wide. Judge commented that they have been able to utilize the consensus process in other aspects of community life, such as the schools. In recent years, the ISD model has picked up momentum as the rural EMS community has worked to redefine its future in the new value-based healthcare frame. While the model and its tools are still being formalized, McGinnis anticipates vetting the model and its resources in a western state yet this year. However, McGinnis has long had a vision for the model. He points out that there are already a lot of highly skilled evaluators of rural EMS, but that sometimes evaluation is expensive and out of reach for small volunteer services. He also acknowledges that most evaluations only examine part of the issue, get too political, or when real operational issues are uncovered, the report gets “nixed” or sits on a shelf. McGinnis envisions ISD as a tool that “anybody that has been responsible for the management of an EMS service and responsible for all facets including the budget” can be trained to guide a community through with an appropriate template. Evaluators would need to be knowledgeable of local salary levels, cost of living, and cost to operate a service, as well as where to get other data in the community to inform the process. This entry was posted in Features and tagged Community engagement and volunteerism, Emergency medical services, Emergency medical technicians and paramedics, Healthcare workforce, Maine, Planning and strategy methods and resources on April 3, 2019 by Tami Lichtenberg.